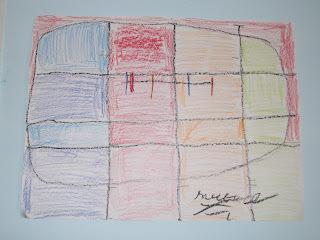 This was a fun lesson in abstract art. We looked at the painting “People and Dog in Sun” by Joan Miro. Without knowing the title, it was hard to know what the painting was about. Once we knew the title, though, we could find the people, the dog, the sun. 1. Change colors every time you come to a line. 2. Try not to have the same color side by side. 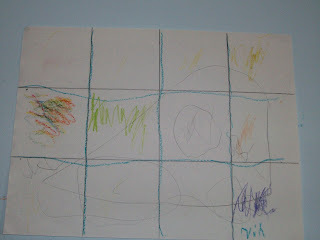 After the coloring was done, they outlined the object and grid in black. 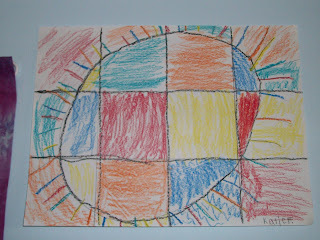 Katie Grace made a sun. I’m not sure what Nicholas made, LOL! And Michael made a football, although he had lots of trouble with the color rules.